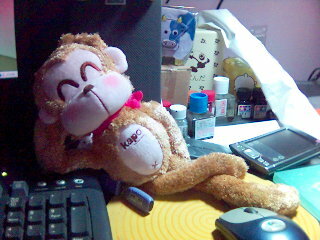 This is Kapo from kapoland.I bought him for Muffin for VDay. Simply cos he revels in killing lupins in Maple Story. Lupins are monkey-like monsters that throw bananas at you when you aggravate them, complete with a ‘toing’ SFX. Previous PostPrevious Happy Valentine’s Day!